The main concept behind content marketing is filling the gap between what the company produces and what the consumer is searching for. Arabic content marketing strategy will always be one of the top marketing activities for companies to grow in the Middle East. Middle East North Africa’s (MENA) online audience is currently one of the fastest growing online segments with high rates of growth. Although the demand for Arabic content is growing, the online Arabic content is still way behind. Only 2% of worldwide content is written in Arabic. And 5% of Fortune 500 websites have an Arabic language version. The gap between the size of the market and the percentage of the content available online is huge. Although there is a gap in content, there is a bigger gap in the distribution, topics varieties, and specialized websites. Social media is playing a big role in the region but would you do if you need you need to discover your content marketing opportunities beyond the social media? What if you want to enhance your organic search results through inbound links? The answer is Arabic content marketing. Do I really need to create a content marketing strategy for Arabic? When it comes to the Middle East region, companies rely heavily on Paid Ads and Social Media as an effective tactic to accelerate their results. Since Arabic content creation is one of the biggest challenges, the marketers would not recommend it as one of the top approaches. 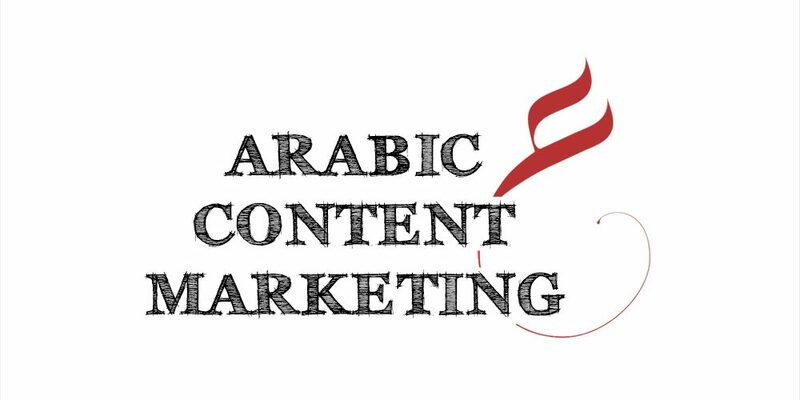 Over the years, clients used to ask me why you always recommend Arabic content marketing. The answer is; simply because it is underestimated! As I’ve learned from the market, not only do you need an Arabic content, you also need to market it to go viral. Now, let’s try to find out the most important practices for an effective Arabic content marketing strategy. What is content going to do for you? Create awareness? Generate leads? Improve loyalty and retention? Those are all important question you’ll need to answer with your strategy. Yet, the most important goals for the regional market would be tricky. It is very important to define first your goals for each local market separately. Avoid the common concept that since all those countries speak Arabic so it takes one strategy. Well, that’s not true! The dialects are different; the trends are tricky; the channels are specific. To get the right conclusion, you will need to divide your goals in the region by countries. Your KPIs and analytic reporting should be defined for each local market accordingly. Separate the KSA market from the Egyptian market to get real insights and to enhance your approach. Forget about the standard principles and drive your researches further into the market. Based on the insights you’ll need to adapt and build a customized strategy. Learn as much as possible about the target segments, their preferred channels, their top sites, their search behavior and the competition. The market is full of gaps and it is a golden chance for those who are willing to take advantage. An effective Arabic content marketing strategy should be fully customized for the local culture. Investing in quality content is one of the most critical issues. Some would imagine that translating their English content is all that it takes. In fact, this would never help you reach your audience in the region. Enhance your content quality and originality. Avoid translating your marketing materials from English to Arabic and start creating original and localized content. Bring in native copywriters, designers, and creative artist to create engaging content. Include the trends into your content calendar. Get the local team involved in the process of content creation. Take the advantage of creating different types of content. There is no enough infographics, video reviews and presentation slides in Arabic and that’s a huge chance. Finally, investing in Arabic content is profitable and very effective in growing your Arabic SEO SERPs. Content marketing is challenging in Arabic. One of the major issues is the lack of specialized websites. If you exclude social platforms and global websites, almost 90% of the traffic in the region is dominated by news portals. If you are trying to market your products, you should think of creating a new story around your product. It might sound tricky but the Arabic news portals are trying to cover all the Arabic readers’ interests from light news to product reviews. The practices of discovering content marketing channels are not the same as in the USA or Europe market. You will have to dig for different approaches. Partner with startups who are taking initiatives of creating content platforms and specialized website. Open a platform for contributions and content creation contests. Get your PR and Social Media teams busy with pushing the content into your network and top influencers. Maintain a very solid relationship with press and media in the local market. Finding Arabic channels for content distribution is not hard after all. It is all about team effort and in-depth researches. Content marketing is an ongoing effort. It is very important to have the seeds for growth and to get all the team involved. Building content and marketing it requires effective online communications as well as offline events. Explore for partnership opportunities on content creation and marketing. Benefit from your internal team and partners feedback to enhance your content marketing plan. As long as your network keeps expanding, your content exposure will grow over time. Over the years, the online market in the region is continuously changing. 8 years ago the forums took the control of Arabic content. Later on and due to Arab Spring, the news portals started to dominate. Now and as we speak, all this started to change again. The startups are taking huge steps in creating platforms for Arabic quality content (check startups like 7awi and Wamda). Video bloggers and independent YouTubers started to generate huge demand vs TV shows, especially in Morocco, KSA, and Egypt. With increasing funds and digital investing the region is a hot spot for content marketing.